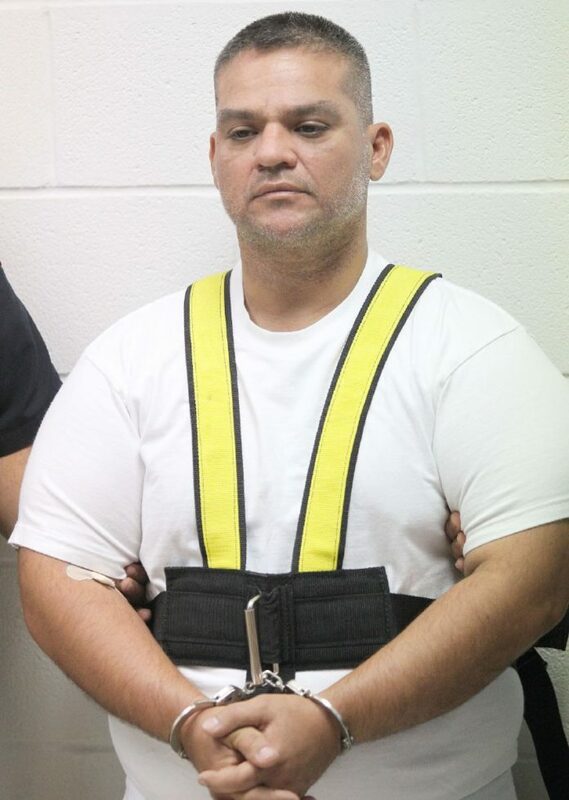 Mateo Fabian Garza, 41, of Edinburg, is arraigned on murder charges by San Juan Municipal Judge Eloy Hernandez on Saturday, August,18, 2018, in McAllen. Bond was set at $2.5 million on the murder of Melinda Garza. A San Juan municipal judge charged a man Saturday in connection with the death of a woman who was found inside a home Thursday, two years after he assaulted his ex-girlfriend. A San Juan municipal judge charged a man Saturday in connection with the death of a woman who was found inside a home Thursday, two years after he assaulted an ex-girlfriend. Municipal Judge Eloy Hernandez charged Mateo Fabian Garza, 41, of San Juan with murder, a first-degree felony, and set his bond at $2.5 million. Mateo Garza, showing no emotion, stood handcuffed before the judge, and did not respond to questions about the murder as he was led away to the Hidalgo County jail. San Juan police released few details about the case, only saying Melinda Garza, 41, was found dead at a home in the city in the 700 block of Shufford Street. Police received phone calls Thursday from friends and family, prompting them to conduct a welfare check at the home where police arrested Mateo Garza. Melinda was in a relationship with the man accused of killing her, according to police Chief Juan Gonzalez. Three of her family members looked on quietly as Mateo Garza appeared for his arraignment. Several dozen friends and family members of Melinda Garza, many of who did not identify themselves, gathered in the lobby of the San Juan Police Department, awaiting the arraignment of the man accused in the slaying. Her sister, comforted by friends and family members, wept in the corner of the room. A group of women, who described themselves as lifelong friends of Melinda Garza, said she was a “great” daughter, mother and grandmother. They said she ran an embroidery business. Though police have not yet released a motive, a woman who only identified herself as Melinda Garza’s relative, alluded to domestic violence between the murder victim and the accused. “The tragedy is you’re involved with somebody that you’re not supposed to be with, and it’s abusive,” she said. Mateo Garza pleaded guilty in 2015 to a misdemeanor charge of assault causing bodily injury for hitting his then-girlfriend, and was sentenced to 180 days in jail followed by community supervision, according to Hidalgo County court records. Though ordered to “avoid injurious or vicious habits” while on probation, Mateo Garza assaulted the woman again eight months later, and was charged with assault of a family or household member with a previous conviction, a third degree felony for committing the crime again, court records show. He was sentenced to 10 years in prison. However, after spending 161 days in jail on the second conviction, he was released in 2016 because the court found, in the “best interest of the public and the defendant,” that he be released on probation for 10 years, according to court records. Mateo Garza was also previously arrested on several other charges including possession of a controlled substance, driving while intoxicated and criminal mischief. He faces up to life in prison if convicted of murder. An autopsy was ordered, but police have not yet released a cause of death. They anticipate releasing further details Monday about the homicide.